Charles Gregory Wade was born and raised in Sydney and such was his prowess in school rugby it was assumed he would make an impact on the English game when in 1880 he won a scholarship to Merton College, Oxford. Wade went straight into the university XV to such effect that he was picked, initially as a travelling reserve, by England for their match at Swansea in December 1882. When Philip Newton, an Oxford forward, got lost on his way to the ground, Wade was called up in his place. It was a match with numerous firsts - Wales' first home game and the first time England played three three-quarters rather than two. And Wade, whose introduction made the innovative reshuffle necessary, was the first of England's many overseas players. Wade ran amok at St Helen's, scoring three of England's six tries. Coming before his first Varsity match, it initiated a big-match career with few parallels. Wade was to play eight times for England, four times for South v North - a major fixture in those days - and in three Varsity matches, winning the lot. Oxford's centenary history records that 'he never walked off the field, for Oxford or England, with a losing side', implying that he was unbeaten throughout his career in England. He returned to Australia in 1886 where he established himself as a barrister. 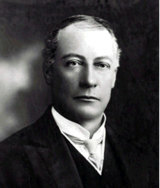 He entered into politics in 1903 and between 1907 and 1910 was Premier of New South Wales. In 1919 he was appointed a judge of the state's supreme court.